Things I liked: They look great, shiny and none were deformed. Being supersonic, the sound was cool. Things I would have changed: Not much, other than a tin that doesn't fight you to remove the lid. Mine stripped out/cross threaded on me. What others should know: Chronograph shows 1,292 fps average, in my Benjamin np2 rifle. Now my Benjamin np2 pistol, they came out at 582 fps average. But with these lightweight pellets, they are no way accurate. Seems as though everyone is a flyer. Sometimes, it is cool to tell you friends that your pellet gun can break the sound barrier. And then deafen them to prove it. 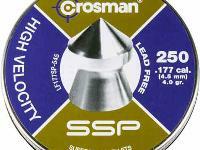 "Shame on me"
Things I liked: I purchased this 4.00 grain Crosman Premier pellet as a fps test on four of my .177 air rifles. This pellet was also shot thru my older Crosman 66 multi pump, which it performed well. 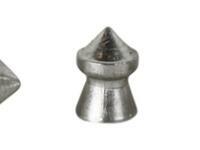 Things I would have changed: I prefer Domed pellets over pointed or hollow point. What others should know: This pellet was shot in strings of five shots from each air rifle, plus the Crosman 66. The Ruger Air Magnum shot this 4.00 grain lead free pellet at a five shot average of 1505 fps with a high of 1532 fps and a low of 1476 fps. The Gamo Big Cat 1250 averaged 1264 fps with a high of 1284 fps and a low of 1217 fps. The Gamo Hunter "220" averaged 1142 fps with a high of 1156 fps and a low of 1132 fps. The Beeman RS2 Silver Kodiak averaged 1152 fps with a high of 1182 fps and a low of 1108 fps. 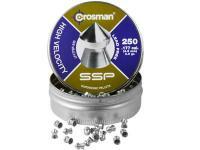 The Crosman 66 Powermaster multi-pump averaged 789 fps with a high of 794 fps and a low of 782 fps. This pellet would not have hunting success and it did not hit the 2" target that was stuck on a 12"x18" box at 70 feet away, some shots missed the box altogether. 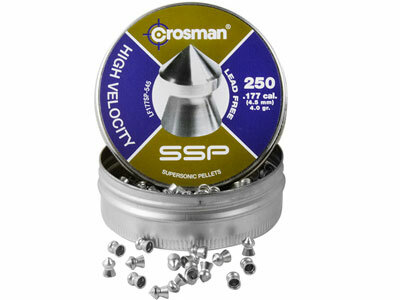 I would purchase this pellet for use on the Crosman 66 and only for testing on my break barrels that were used in this review. All of my four break barrels are not "neighbor friendly" when shooting this pellet. Shot in 52-55 deg. weather. What others should know: They are a little pricey, but in certain pistols, they are great, My Beeman P17, is one hell of a Squirrel Terminator well up to 40 ft. with these! 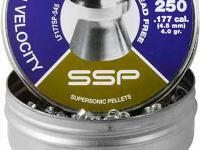 I have a Beeman P17 pistol as well and these pellets perform better than any other out of it. At 20 yards they are more accurate than all of the dozen or so lead pellets I tried. Of course they are not going to be accurate when they break the sound barrier, that sonic boom catches up to the pellet and throws it off course. But out of a slow single pump pneumatic pistol that usually only shoots 400 fps like the Beeman P17 they are wonderful!